Chicago—On Aug. 20-21, the city put on its 58th annual Air and Water Show where various planes travel in formations to entertain crowds in Lincoln Park. The show is free and attracts many working-class families. A small group of anti-war activists gathered to counter the message that lies beneath the aerobatics sponsored by Shell and Boeing: war planes are cool, war is cool. Signs of the countries the U.S. is now bombing. Photo: Buddy Bell. Spectators walking by, dragging coolers and pushing strollers over the North Avenue footbridge, were treated to a display of each of the seven countries that the U.S. is bombing at this very moment. 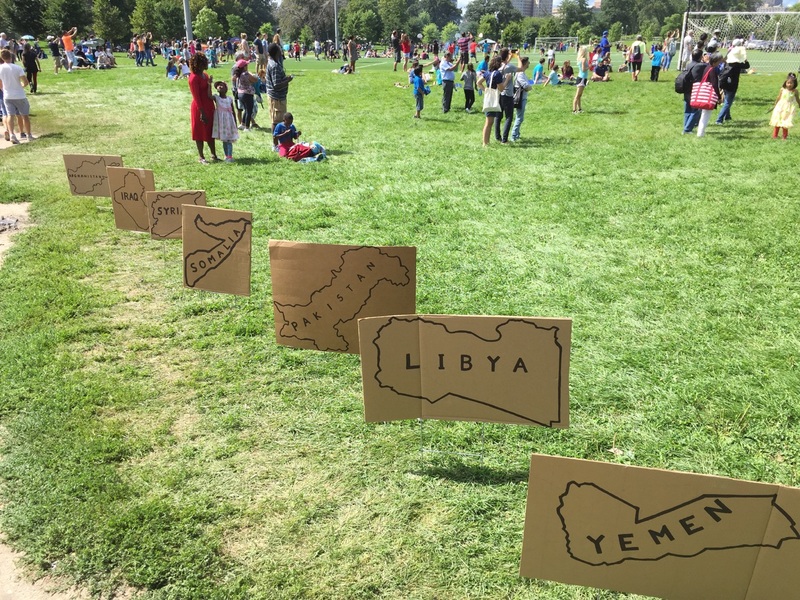 Afghanistan, Iraq, Libya, Pakistan, Somalia, Syria, and Yemen were each pictured on their own placard and named. Passersby were asking about the signs. One person did not think we were at war with Somalia, so I told him to look in an online newspaper for U.S. announcements of killing al-Shabaab members (and people in their vicinity) with drones. Several people engaged me on the “Free Chelsea Manning and All Whistleblowers” sign I held. Many people do not know who Chelsea is, or that she faces new charges for allegedly attempting suicide. Asking if she was really still in prison, some were shocked to learn that she is serving a 35-year sentence for espionage. If these wars are to end, people must learn what is really going on. They must become cognizant of important videos and information leaked by Manning. Neither of the major presidential candidates is going to tell people for us; the task is our own. This entry was posted in Articles and tagged Afghanistan, Air and Water Show, al-Shabab, Boeing, Buddy Bell, Chelsea Manning, Chicago, Iraq, Libya, Pakistan, Royal Dutch Shell, Somalia, Syria, Yemen. Bookmark the permalink.